BioSafe Systems incorporates SaniDate disinfectant in its mold remediation and restoration product line. 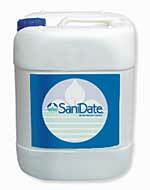 SaniDate disinfectant treats and eliminates algae, bacteria, fungus, mold, slime, and odor. The peroxygen chemistry provides treatment without the use of toxic, potentially restricted, or discharge regulated products. SaniDate disinfectant is EPA registered. The liquid concentrate mixes easily in water without agitation and offers coverage with and without additional surfactants. It kills on contact and eliminates the potential for mutational resistance.